At that moment, a huge ape arrived at the summit and set foot on the edge. He turned round, drew himself up to his full height and lifted his victim into the air-and the hairy giant uttered a roar, like a cry of war and victory: "Ouha! Ouha! Ouha!" Behind him, the great apes reappeared, and there was an immense, quasi-human and guttural acclamation, as if to a glorious leader: "Ouha! Ouha! Ouha!" 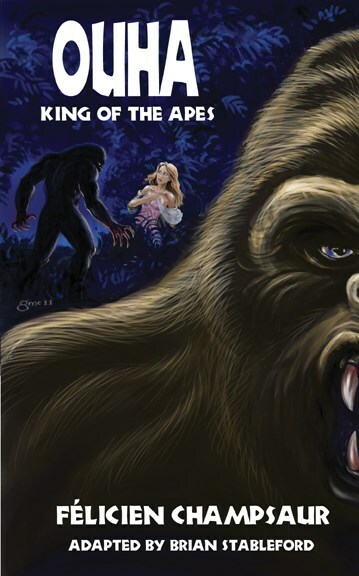 Félicien Champsaur's Ouha, King of the Apes (1923) is the thematic "missing link" between Edgar Rice Burroughs' Tarzan of the Apes (1912) and Edgar Wallace's King Kong (1933). In it, Ouha, an exceptional ape from the jungles of Borneo, is educated and transformed into the "Napoleon of Apes" by a well-meaning American scientist. But tragically, Ouha eventually falls victim to a "Beauty and the Beast" doomed romance. There is an archetypal quality to the character of Ouha, as there is to Tarzan and King Kong; if he is no more plausible than Jules Lermina's To-Ho, he is no less relevant as a specter at the feast of civilization and modern morality.